How Pink Champagne is created? The Champagne region made rosé wines before ever producing sparkling wines. More or less disdained during the 20 th century, pink champagnes are once again much sought after by wine lovers. This is as much for their delightful taste and aromatic richness as for their lovely colour. There are two main methods of creating pink champagne. This method is by far the most widespread, as it allows the producer to obtain colour and density that is identical from year to year. It consists of blending a still white wine (before its second fermentation in bottle, therefore) with from 5 to 20% of Champagne red wine, vinified to be non tannic. This is the method used for many years by Francis Boulard. It consists of allowing the grape must to remain in contact with the skins for a short while (just a few hours). Thus the natural pigments in the skins of the black grapes begin to colour the juice and at the same time they enrich the juice with their aromatic components. After maceration, the juices are bled off - hence the name. 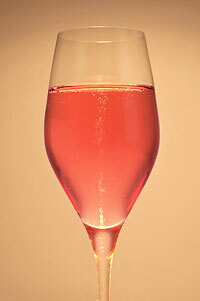 "Bled" pink champagnes generally have a more intense pink robe, but this colour can vary widely with different vintages (which does not have any deleterious effect on the quality). These "rosé de saignée" champagnes are generally richer in taste and have a vinous character which makes them particularly suitable to be served with food.